Keeping up with Tesla's frequent pricing changes has become a job all on its own. After delivering 200,000 vehicles, Tesla triggered a clause in the US $7,500 tax credit for EVs, which lowered the incentive down to just $3,750. This meant customers would effectively have to pay more for their cars. Tesla then decided to charge 3%, making things even more expensive for buyers. On the other side of the country, General Motors quietly triggered the clause in the tax credit by selling over 200,000 units of the Chevy Bolt. This means Bolt buyers will only receive a $3,750 tax incentive back from the government. But whereas Tesla CEO Elon Musk frantically took to Twitter post a "Reminder to US buyers that the $7,500 tax credit cuts in half in 5 days," Chevy is taking a much different approach, choosing not to change Bolt prices. When asked by Reuters why the company decided not to adjust Bolt prices based on the loss of incentives, spokesman Jim Cain said: "it is easier to react to the market by working with dealers and your marketing team than it is to change sticker prices." 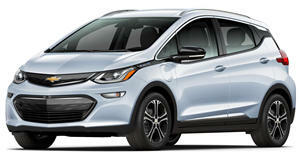 GM is currently offering a 14% incentive on the Bolt EV but will offer new incentives in April. Cain said GM is "sensitive to affordability” for EV customers but did not mention any future incentives. By October of 2019, GM's tax credit for the Bolt will drop to $1,875 before disappearing completely in April 2020. Tesla only has until July before its tax credit drops again and only until the end of 2019 until it disappears. EV sales still only represent a small portion of the market so it will be interesting to see if they continue their momentum without a tax credit from the government.